Senior Lecturer in Politics at Goldsmiths, University of London. Her work explores the interaction between gender, feminist activism and political representations in formal and informal locations. Lecturer in Gender and Politics at the University of Edinburgh. 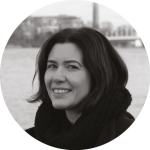 Her research interests bridge the intersection of gender politics, party politics, territorial politics, and institutional approaches to the study of politics. The Women’s Equality Party (WEP) started with a (seemingly) throw-away comment made at the Women of the World Festival in March 2015, from British author and journalist Catherine Mayer. Frustrated by a panel discussion on women in politics, Mayer intervened from the audience: “Let’s form a women’s party and see what happens. I’ll be in the bar afterwards if anyone wants to discuss it.” By the end of the festival, Mayer acquired a party co-founder in comedian and presenter Sandi Toksvig. WEP was officially registered with the Electoral Commission in July 2015, and, in the same month, Sophie Walker was announced as the party’s new leader. Just two years later, the party has acquired more than 65,000 members and supporters, with over 50 branches across the nations of the UK, and fielded candidates for the first time in 2016 in the devolved and London mayoral elections. Unsurprisingly, for a new party, organising for a snap election was a challenge. WEP decided it was unlikely to field a full slate of candidates. Instead, it worked closely with local branches, evaluating whether or not to stand a candidate on a constituency by constituency basis, with the ultimate decision was taken centrally. The party targeted seven seats, but did not concentrate their efforts on particular regions or parties. The party fielded an all-women list of parliamentary candidates including two BAME women. In all other constituencies, WEP claimed that they were looking to ‘forge alliances’ with other parties who shared their values. WEP came to an agreement with the Green Party: in exchange for the latter standing aside in Shipley, where party leader Sophie Walker was challenging Conservative MP Philip Davies, WEP agreed not to stand in five key seats being contested by Green women (Brighton Pavilion, Bristol West, Bath, Isle of Wight and Sheffield Central). WEP’s presence in two of these races proved controversial. In Shipley, a safe Conservative seat held by high-profile anti-feminist Philip Davies, the party attracted criticism for potential vote splitting and for its failure to engage with local feminists, the Shipley Feminist Zealots (so named after Davies described feminists as “zealots who want to have their cake and eat it”). The second controversial contest was Hornsey and Wood Green, held by Labour MP Catherine West. Walker had previously declared that the party would stand candidates against female candidates who failed to demonstrate support for its goals; yet their decision to stand against Catherine West appeared to be motivated more out of a desire to stand in a seat where they had a large concentration of members rather than because of West’s record. The party fielded Nimco Ali, a high profile anti-FGM campaigner, who had to repeatedly justify her candidacy, arguing that she was ‘standing for equality’, rather than against a particular candidacy. The day before the election, the party called the police to investigate a series of threats targeted at Ali. The party provided a costed manifesto which, in addition to building upon its seven core policy issues (equality in healthcare, representation, pay, parenting, education, media treatment and an end to violence against women), also detailed the party’s vision for a caring economy, Brexit and immigration. 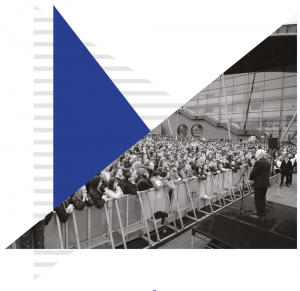 The party also filmed themselves hand delivering their manifesto to the other parties, promoting this with the hashtag #nickablepolicies, to encourage other parties to adopt their policies. Staff members at all the parties accepted a copy apart from Labour, which WEP said refused. 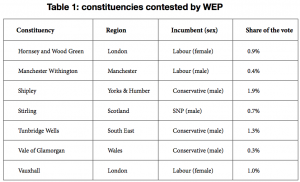 This was a snap election, making it difficult to reach sweeping conclusions about WEP’s performance. However, the party has struggled to make an electoral impact, losing all seven of its deposits. 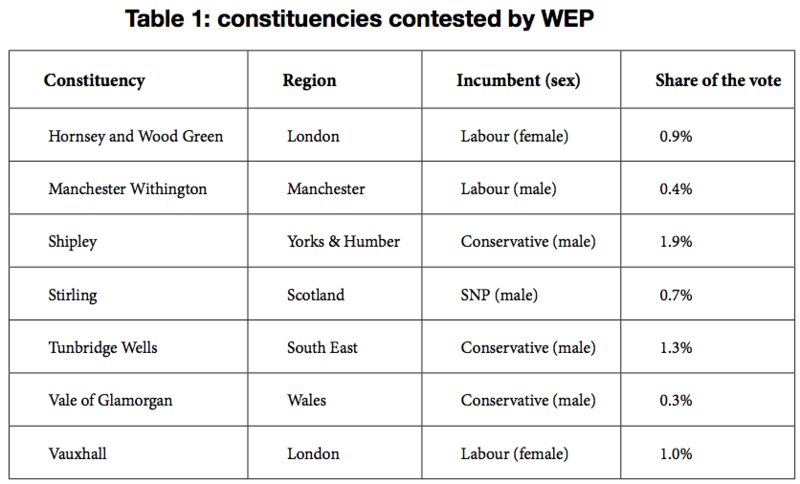 And while WEP has high profile members and significant media savvy, its policy positions failed to cut through the election headlines – particularly in a context where all of the main British parties have responded to demands for women’s individual and collective representation. The UK’s first-past-the-post electoral system, as well as the seeming return to two-party politics in the 2017 GE, present significant obstacles for the party. But the campaign will have galvanised WEP’s supporters, and afforded campaign experience for WEP party members and activists. Moreover, the political uncertainty resulting from the 2017 GE, particularly over Brexit negotiations, may create further spaces for the Women’s Equality Party to engage with the electoral process and get women’s issues on the political agenda.